Money never sleeps and business doesn’t take weekends. Contestants in this year’s Start-up Sunday, a business competition for entrepreneurs, at Saint Mary’s University are likely to be living that mantra as they prepare for the event. Competing teams are made up of one Sobey School of Business MBA student, one Executive MBA student and a working professional from the business community. They have one weekend to get together, brainstorm and pitch their ideas. Only three teams will make it past the first weekend. Those that make the cut get one more week to fine-tune their business plans and present them in a 20-minute pitch at the Halifax Entrepreneurial Expo. 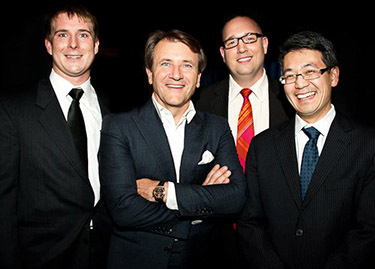 Robert Herjavec, former host of CBC’s Dragon’s Den, with the winning team from Start-up Sunday 2012. The team is now developing Events Atlantic, a single spot to view or promote events for all of the east coast. Photo: partridgephoto.ca. The winner will be announced at the Dine with a Legend dinner, with guest Arlene Dickinson from CBC TV’s Dragon’s Den. The $10,000 grand prize will help the team start up their new venture. “It makes people with a little more ‘street skills’ pair up with people who have formal training,” he adds. “It’s about collaboration. In a lot of ways entrepreneurship activity is very solo based. One person has an idea and tries to create it, there’s not a lot of partnership. We’re trying to encourage that,” Calvert says. The competition benefits both students and the Halifax community says Patrick Farrar, one of the winning team members from last year’s contest. After a successful debut last year, the winning team is developing their idea, Events Atlantic. This year’s contest will have 10 teams of three competing, doubling 2012’s roster. The school is holding a Start-up Sunday information session on Thursday, Feb. 7, at 5 p.m. in the Sobey Building.